Военен самолет Ан-72 с регистрационен номер UP-72859 катастрофира в Казахстан. Загинали са всичките 27 души на борда му. Със самолета пътували високопоставени военни от казахстанските гранични войски, сред които и директорът на граничната полиция на страната полковник Турганбек Стамбеков. Машината излетяла от столицата Астана и се разбила на 20 км от летището на Шимкент, южен Казахстан. Полетът в района на катастрофата се изпълнявал в условия на снежна буря, намалена видимост, нощем. Води се разследване. В результате крушения самолета Ан-72 (UP-72859), которое произошло накануне вечером близ Шымкента, погибли 27 человек, которые находились на борту, в том числе глава Погранслужбы Казахстана Турганбек Стамбеков с супругой. Также начальник управления пограничных войск "Онтустiк" Павел Доценко и руководители погранотрядов "Кордай" и "Сарыагаш". Все они находились 25 декабря в Астане для участия в заседании Военного совета. Руководство Пограничной службы направлялось в Шымкент для проведения совета в Региональном управлении "Онтустiк".. В настоящее время на месте авиакатастрофы работает межведомственная комиссия по расследованию авиационных инцидентов. В Шымкент вылетел председатель КНБ республики Нуртай Абыкаев. Всю ночь на месте авиакатастрофы работали пожарные, спасатели, полицейские. Во время катастрофы шла буря. По словам очевидцев, самолет пролетел очень низко над селом, затем был сильный взрыв. АН -72 упал в карьер цементного завода. An Antonov 72 passenger plane (UP-72859) crashed some 20 km from Shymkent Airport (CIT), Kazakhstan. All 20 passengers and seven crew members were killed. The airplane was operated by the Kazakhstan Border Guards. Amnong those killed was acting director of National Security Committee's Border Guard Service, Colonel Turganbek Stambekov. Weather at Shymkent was poor with heavy snowfall and limited visibility. 01.12.2012*/US/ FL/ Palm Beach County/ Pahokee - A T-18 Tiger light plane (N118GG) crashed in a field killing the pilot. */US/ MI/ Oceana County/ Walkerville/ Tanner's Swamp - A Bell 47G-2 helicopter (N3755Z) crashed into a swampy area killing the pilot, injuring seriously the passenger. 02.12.2012*/US/ MN/ Rochester/ Rochester International Airport (KRST) - A Cessna 172M Skyhawk plane (N9853Q) missed the runway on landing in heavy fog, bounced and flipped over injuring 2 of the four occupants. */US/ IA/ Woodbury County/ Correctionville - A 1961 Beechcraft P35 Bonanza plane (N1566Z) crashed on landing and caught fire killing 2, injuring 1 on board. The injured man succumbed on 11.02.2013 due to his injuries and burns. */US/ HI/ Kahului - A Cessna 172S Skyhawk SP plane (N3554Y) with a pilot on board missing. */US/ IN/ Greensburg - A Piper PA-46-350P Malibu Mirage plane (N92315) crashed on approach killing all 4 people on board. */US/ MT/ Billings Logan International Airport (KBIL) - An Aerotek Pitts S-1T plane (N49309) crashed and flipped over on landing. 05.12.2012*/Mexico/ Baja California Sur/ 36 km SE of La Paz - A military Zlin 242L plane crashed during a training mission. Both occupants died. */US/ NV/ west of Hiko - An UAV General Atomics MQ-9 Reaper crashed during a nighttime training exercise. */Germany/ Over Baltic Sea - An Eurocopter AS 350 Ecureuil helicopter with 2 occupants is missing. */Zambia/ Muchinga Province/ Shiwangandu area - Zambia Air Force Harbin Z-9 helicopter (AF746) with 11 occupants crashed on takeoff into trees. One person on the ground was hurt in the incident. */US/ MO/ SE of Bolivar - A Stinson 108-2 plane (N8775K) experienced a loss of power and clipped trees and power lines during a forced landing in a field. Eleven people, including six crew members, were killed when the South African National Defence Force Dakota DC3 C47 (6840) crashed in bad weather on Wednesday. The plane left the Waterkloof Air Force Base in Pretoria en route to Mthatha in the Eastern Cape. After initial speculation, the Defence force confirmed that none of former president Nelson Mandela’s medical team were not among the victims. President Jacob Zuma sent his condolences to the families of the Drakensberg plane crash victims. 06.12.2012*/India/ New Delhi/ Delhi-Indira Gandhi International Airport (DEL/VIDP) - SpiceJet Boeing 737-9GJ/ER (VT-SPT), operating as flight SG 239 from Delhi to Hyderbad , hit an electric lamp post during taxi for departure damaging the right wing. No injuries. 07.12.2012*/Mexico/ La Yesca Airstrip - A Britten-Norman BN-2A-7 Islander ambulance plane (XC-UPJ) took off with 2 soldiers who had been injured in a traffic accident, but hit a tree and crashed in bushes due to strong winds. The pilot was only slightly injured, and the two soldiers also escaped alive. */US/ TX/ Houston Southwest Airport (KAXH) - A Cessna 172M Skyhawk plane (N172BJ) made an emergency landing in a field and flipped over. */US/ CO/ Denver/ Centennial Airport (KAPA) - A Cessna 172S Skyhawk SP plane (N415RJ) suffered a bird strike during approach. An eagle broke the windshield of the Cessna 172S. 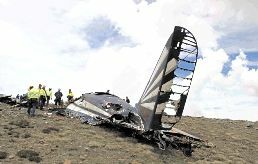 The pilot suffered minor face injuries, but managed to land the plane safely. */US/ TX/ Abilene Regional Airport (KABI) - An Enstrom F-28C training helicopter (N574H) made an emergency landing due to an engine failure, damaged. */US/ CA/ near Tehachapi Municipal Airport (KTSP) - A Bellanca 7ECA Citabria plane (N8595V) crashed in a field during approach in foggy weather. The pilot escaped minor injured. */Netherlands/ Groningen-Eelde Airport (GRQ/EHGG) - A Piper PA-34-220T Seneca V plane (PH-WDL) collapsed the nose gear on landing. */US/ AZ/ NE of Phoenix/ Roosevelt Lake - A Robinson R44 Raven II helicopter (N557AC) crashed into Roosevelt Lake. The 3 passengers onboard the helicopter received serious injuries. */US/ HI/ Joint Base Pearl Harbor-Hickam - An F-22 fighter jet that had performed a flyover at a Pearl Harbor anniversary event, Friday, later scraped its tail on landing at Joint Base Pearl Harbor-Hickam, causing an estimated $1.8 million in damage to the jet. 08.12.2012*/Germany/ Hessen/ near Wolfersheim - A Piper PA-32-301 Saratoga (D-EUEU) and a Robin DR.400 (D-EHJP) both crashed following a mid-air collision. All 5 occupants of the Saratoga and all 3 occupants aboard the DR.400 were killed. */Russia/ Moscow Oblast - A Robinson R44 II helicopter (RA-04189) crashed killing the 3 occupants on board. 09.12.2012*/Mexico/ near Iturbide - A Learjet 25 corporate jet (N345MC) crashed killing all 7 people on board, including the famous Mexican-American singer Jenni Rivera. 10.12.2012*/US/ IL/ Rochelle - An ambulance MBB BK 117A-3 helicopter (N911BK) crashed in a field killing the pilot and 2 nurses. */Brazil/ MG/ Ibia - A Cessna 182P Skylane plane (PT-IMJ) crashed on landing and caught fire. */Algeria/ Ain Nehala - Two military planes, reportedly MiGs, collided in a mid-air. Both pilots were killed. */Pakistan/ Malir cantonment - A training Cessna 172D Skyhawk plane (AP-BHT) crashed. No injuries. 11.12.2012*/US/ ND/ Grand Forks (KGFK) - Cessna Citation (N212M) sustained substantial damage to both wings while inflight. No injuries. */Brazil/ Goias/ Goiania - An Eurocopter AS 350BA Ecureuil helicopter (PT-YSW) crashed while was performing a test flight. No injuries. 12.12.2012*/US/ CA/ San Diego/ North Island Naval Air Station - US Navy Sikorsky MH-60R Seahawk helicopter made a hard landing injuring 4 occupants. */Afghanistan/ Helmand province/ Nava district/ Barana area - An unmanned (UAV) aircraft crashed. 13.12.2012*/US/ TN/ Murfreesboro Municipal Airport (KMBT) - A Cessna 172P Skyhawk plane (N54500) ran off the runway and hit a hangar injuring seriously the student pllot. 15.12.2012*/US/ UT/ Logan/ Logan-Cache Airport (KLGU) - A training Robinson R22 Beta II helicopter crashed on landing. Both the instructor pilot and student pilot sustained minor injuries. */US/ VA/ Williamsburg International Airport - A Piper PA-28R-180 Cherokee Arrrow plane (N3915T) crashed into a hangar. */Colombia/ Aguamansa Bay/ Island of Providencia - A military Sikorsky AH-60L Arpia III helicopter (FAC 4130) made an emergency landing injuring 3 occupants. 16.12.2012*/Tanzania/ Katavi region/ Mpanda district/ Nsemlwa village - A Cessna 182Q Skylane plane (5H-FZS) crashed injuring the pilot. */US/ SD/ Winner - A military Sikorsky UH-60 helicopter sustained damage to its rotor and fuselage after striking an airport hangar. 17.12.2012*/UK/ Gloucestershire/ Cheltenham/ Staverton/ Gloucestershire Airport - An Alpi Aviation Pioneer 400 plane (G-CGAJ) collapsed the landing gear on landing. */India/ Begumpet Hyderabad airport - An AgustaWestland AW139 helicopter (VT-APC) and 6 trainee aircrafts of the Andhra Pradesh Aviation Academy were destroyed by fire. */Italy/ Sondrio Province/ Pizzo Tambo - Guardia di Finanza helciopter crashed injuring seriously the 3 occupants. */Australia/ QLD/ Fraser Coast/ Barrum Heads - A Cessna 182A Skylane plane (VH-SGB) crashed on approach killing the pilot. */Peru/ Yauyos Cochas province/ Tomas - An Amazon Sky Antonov AN-26, registration OB-1887-P, performing a freight flight from Lima to Cusco Malvinas (Peru), crashed in a mountain and exploded killing all 4 crew members. 18.12.2012*/US/ FL/ Hamilton County/ between Jasper and Live Oak - A training Zenair CH-2000 Alarus plane (N1204D) crashed on landing. No injuries. 19.12.2012*/US/ FL/ Lido Key/ Gulf of Mexico off Lido Beach - A Steen Skybolt plane (N328GW) crashed due to an engine failure and ditched in the Gulf of Mexico. The pilot received minor injuries. 20.12.2012*/US/ NC/ Indian Trail/ Goose Creek Airport (28A) - A single-engine Cessna plane overran the runway on landing and crashed into some bushes and trees. */Antarctica/ Holtanna Peak/ Holtanna Glacier - Kenn Borek Air Basler BT-67 plane (C-GEAI) crashed on takeoff injuring slightly 2 passengers. */US/ VA/ Hot Springs-Ingalls Field (HSP/KHSP) - A Grumman American AA-5 Traveler plane (N5813L) veered off the runway in gusty wind conditions during landing and hit some trees, damaged. No injuries. 21.12.2012*/US/ OK/ Oklahoma City-Will Rogers Airport (OKC) - A Cessna 550 Citation II plane (N753CC) crashed on landing injuring slightly 1 of the 2 occupants. 22.12.2012*/Canada/ NU/ Sanikiluaq Airport - Kivalliq Air SA227-AC Metro III chartered plane (C-GFWX) crashed on approach killing a six-month old infant and injuring slightly the remaining 8 occupants. 23.12.2012*/US/ MN/ Corcoran - A Robinson R22 Beta II helicopter (N27AT) crashed on landing injuring slightly the pilot. 24.12.2012*/US/ FL/ Leesburg/ Dennis Road - A Piper PA-31-350 Navajo plane (N78WM) crashed on approach killing the pilot and injuring seriously the passenger. */US/ TX/ San Antonio/ Twin Oaks Airport - A Globe Swift II plane (N84NS) crashed after takeoff. No injuries. 25.12.2012*/Myanmar/ Heho Airport (HEH) - A Fokker 100 passenger plane (XY-AGC) operated by Air Bagan crashed on approach killing 1 passenger, injuring 8 of 71 people on board. A person who was travelling on a motor cycle on the ground was hit by the aircraft as it landed and was also killed. The fuselage broke in two and a fire erupted, destroying the plane. 26.12.2012*/US/ OK/ Tulsa/ Jones Riverside Airport - The throttle of Cessna-172R plane (N387ES) became stuck as a mechanic was moving the plane from one hanger to another. The plane flipped and the man was injured. */Syria/ Hama: Kafar Zeta - Syrian Air Force MiG jet shot down by rebels. */Syria/ Mazzeh Mlitary Airport - Syrian Air Force Mi helicopter shot down by rebels. */Brazil/ MG/ Para de Minas - A training Piper PA-28-181 Archer III plane (PR-NAX) crashed killing the 2 occupants. 29.12.2012*/US/ TX/ Giddings-Lee County Airport (KGYB) - A Grumman American AA-5B Tiger plane (N4513N) collapsed the nose gear on landing. 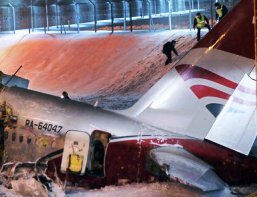 A Tupolev 204 passenger plane, RA-64047, owned by Red Wings Airlines, was destroyed following a landing accident at Moscow-Vnukovo Airport (VKO), Russia. The Russian Interior Ministry reported that the captain, copilot, flight engineer and one flight attendant were killed. The remaining four crew members sustained serious injuries. Later the injured flight attendant Tatyana Penkina died due to her injuries. The airplane departed Pardubice Airport (PED), Czech Republic about 11:10 local time as Red Wings Airlines flight RWZ9268 to Moscow-Vnukovo Airport (VKO). Flight 9268 approached from the north and landed on runway 19 about 16:33 local time. The Tu-204 overran the runway and collided with the M3 highway embankment. It broke into three and the forward part of the fuselage came to rest on the highway. The distance between the end of the runway and the embankment is about 320 m on downsloping terrain with a sharp dropoff of 10 metres at the embankment. It had been snowing prior to the accident and there was a significant cross wind with gusts up to 29 knots. 30.12.2012*/India/ Jammu and Kashmir/ Reasi district/ Katra/ Trikuta Mountains foothills - Pawan Hans Helicopters (PHHI) Bell-407 helicopter (VT-PHH) made an emergency landing and tilted injuring the 7 occupants. */US/ AZ/ near Chandler airport - A Cessna 210 lost power on approach to the airport and the pilot had to make a forced landing about a quarter-mile south of Chandler Municipal. The plane collapsed the nose gear. 31.12.2012*US/ FL/ Manatee County/ Palmetto - An ultralight plane crashed killing the pilot. */Honduras/ San Pedro Sula Airport (SAP) - Easy Sky British Aerospace 3101 Jetstream 31 passenger plane (HR-AWG) veered off the runway and came to rest in a ditch while it was landing. One of the pilots suffered minor injuries.